The Vandersteen Audio speaker lineup continues to evolve as a result of the research & development efforts that delivered the patented carbon-fiber Perfect-Piston™ drivers used in the flagship Model Seven. Vandersteen’s Treo loudspeaker is now available in an optional TreoCT version (Carbon Tweeter), which is a $1,500 upgrade that features the superb Carbon Tweeter from the renowned Model 5A Carbon. Carbon driver cones offer the pistonic linearity of metal drivers without the unnatural sonic colorations inherent in metal drivers. While the Perfect-Piston Tweeter used in the flagship Model Seven is the fully embodied ideal of high-frequency purity and resolution, the Treo CT delivers a surprising amount of the air, space and natural purity previously heard only in Vandersteen’s top speaker models: the Quatro Wood CT, Model 5A Carbon and the Model Seven. The Treo is essentially a passive version of the Quatro Wood CT, sharing the same driver complement sans the powered-bass system. It too is offered in an array of wood finishes in a strikingly attractive form factor. Like the legendary Model 2, the Treo is a paragon of cost-effective performance that’s made in the USA, but in an elegant outer package. 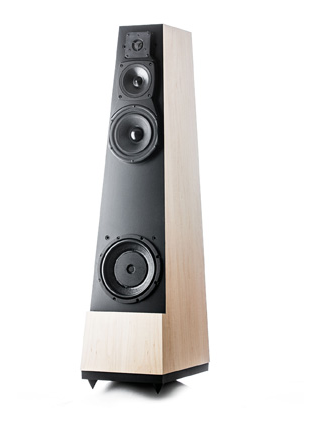 The Treo is a time- and phase-correct full-range loudspeaker. 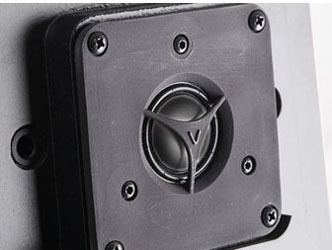 Because such great demands are placed on the drivers in Vandersteen’s first-order speaker designs, the Treo’s drivers are the kind of highly advanced transducers typically found in cost-no-object designs. The proprietary transmission-line loaded tweeter and Vandersteen’s proprietary Reflection-Free 4.5” midrange driver break up energy from behind these drivers before they can pass directly back into the room and to the listener’s ears. The 6.5” Tri-Woven woofer offers superior transient response and definition in the crucial lower-midrange/midbass frequencies, with the bass foundation supplied by the ported, carbon-loaded 8” woofer with an ultra-long motor assembly. The impedance-compensated crossovers are ultra high-performance designs featuring extreme-quality parts, and individually tuned in an anechoic chamber. Vandersteen’s Minimum Baffle enclosures ensure maximum rigidity, free of time-smearing reflections and diffraction. All of this technology allows the Treos to offer the kind of exceptional resolution, imaging and natural musicality Vandersteens are known for.